Kristen and Austin's wedding at the Mining Exchange hotel in Colorado Springs is a modern-day fairytale, complete with a classic church ceremony, a vintage car, a gorgeous couple - and, oh, that dress. Let's talk about that dress for a minute. 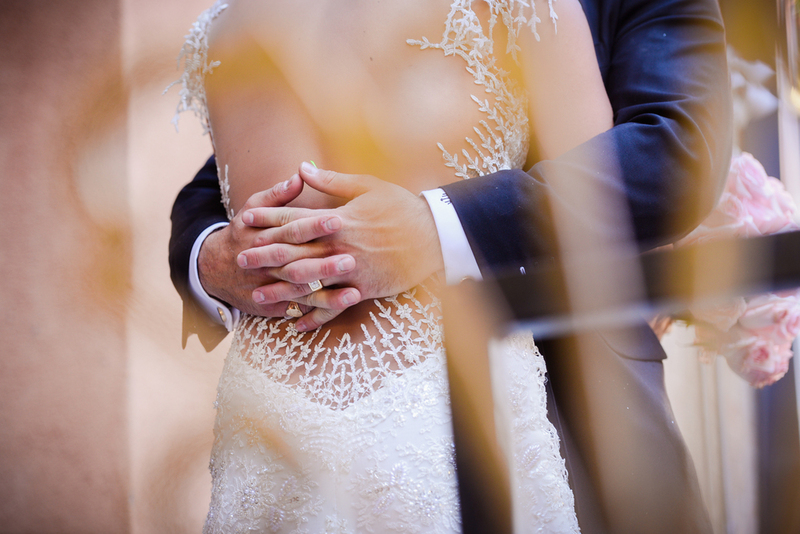 Kristen fell in love with her Galia Lahav Giselle gown during our first ever Galia Lahav trunk show, and no wonder - the drama of the skirt, the intricately embroidered lace, delicate sleeves, and an open back make this dress like no other. Not to mention that Kristen absolutely glows in the gown, which was literally made just for her. Topped off with earrings, hair accessories, a bracelet, and the Emmy London Cinderella shoes, all from Little White Dress, Kristen's look is the epitome of princess chic. Congratulations to Kristen and Austin, and many thanks to Elevate Photography and Adam Fusion Films for the stunning photos and film! (Don't miss their sneak peek wedding film at the end of the post)! Do you love Kristen's Galia Lahav gown? Find your own picture-perfect gown at our exclusive Galia Lahav Trunk Show, October 2nd-4th. Click here to request an appointment.